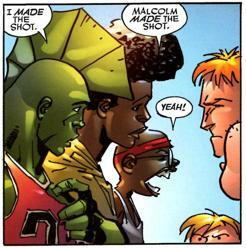 After Malcolm Dragon ended his years of exile in Dimension-X, the young teenager finally began regular school. Malcolm gained a number of friends but his closest were P.J. and Darnell Washington. When P.J.’s mother was killed by a rampaging Snake-Eyes, the youngster was taken in by the Little Wise Guys as one of their own. P.J. later makes a blood pact with Peewee and they both soon discover that Peewee’s blood actually stop him from aging. Due to sharing blood with Peewee, it is believed that P.J. will no longer age. Later when the Claw returns from the dead, P.J. along with the Wise Guys tell Daredevil that his arch enemy is now among the living. P.J. is the only witness to the Little Wise Guy being kidnapped which eventually would lead to their deaths. P.J. is not seen for quite sometime until Angel has a house warming for her new apartment and P.J. is invited. P.J. is later seen unhappy about the fact that he isn’t aging when Malcolm visits him in hopes of finding a cure for Maxine’s dads cancer. P.J. later takes Freak-Out and begins to age normally.